Allergy Advice: Contains Gluten, Fish, Soybean. Produced in a factory where crustacean, egg, peanut, milk and nut products are also handled. Ingredients: Potato, Palm Oil, Canola Oil, Sugar, Soy Sauce Powder (Soybean, Flavour Enhancers (E621, E631)), Colour (E150c), Seafood Extract, Flavour Enhancers (E621, E635), Seaweed, Salt, Hydrolysed Wheat Protein, Anti-caking Agents (E170(i), E341(iii), E551), Shiitake (Vegetable) Extract, Tangle Powder, Spices, Flavourings. 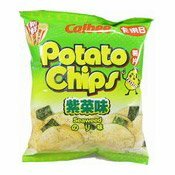 Simply enter your details below and we will send you an e-mail when “Seaweed Flavoured Potato Chips (卡樂B紫菜薯片)” is back in stock!